What is Metacam used for? Metacam oral suspension is a medication for dogs to help treat and manage the pain and inflammation that can be caused by osteoarthritis. Many dogs suffer from osteoarthritis, particularly as they age. Osteoarthritis is caused by wear and tear of the joints and can cause pain, swelling and stiffness, particularly in the knees, elbows, hips and backbone and restrict your dog’s activity. Metacam oral suspension can help relieve symptoms of osteoarthritis and improve your dog’s mobility and general demeanour. Metacam oral suspension can also be used to help control pain and inflammation following orthopaedic and soft tissue surgery in dogs. Metacam oral suspension contains meloxicam, which is non-steroidal anti-inflammatory (NSAID) drug belonging to the oxicam class. Meloxicam in Metacam oral suspension inhibits cyclooxygenase (particularly COX2) the enzyme involved in production of chemicals called prostaglandins that are mediators of inflammation. By inhibiting prostaglandin production, Metacam oral suspension reduces inflammation and relieves the pain, swelling and stiffness in the joints caused by osteoarthritis. Metacam oral suspension contains meloxicam, which is non-steroidal anti-inflammatory (NSAID) drug used to treat osteoarthritis in dogs. Many dogs suffer from osteoarthritis, particularly as they age, and normal wear and tear of the joints can cause pain, swelling and stiffness, particularly in the knees, elbows, hips and backbone, and restrict your dog’s activity. Meloxicam in Metacam oral suspension inhibits the production of chemicals called prostaglandins that are mediators of inflammation and this helps relieve the pain and inflammation of osteoarthritis and improves your dog’s mobility and general demeanour. The most commonly reported side effects reported when using Metacam oral suspension in dogs include: gastrointestinal problems; vomiting, diarrhoea and loss of appetite. It can also cause lethargy, and kidney and liver problems, also stomach ulcers are possible. When should Metacam not be given to your dog? How should Metacam be given to your dog? You should give your dog Metacam oral suspension once a day either mixed into your dog’s food or directly into the mouth. You should follow the instructions provided when administering Metacam oral suspension to your dog. The first dose should be 0.2mg/kg body weight (0.1mg/lb) on the first day of treatment, then you can reduce the dose to 0.1mg/kg (0.05mg/lb). For dogs greater than 4.5 kg (10lbs) it is easiest to use the dosing syringe, for smaller dogs (under 4.5kg or 10lbs), you can the use the calibrated dosing syringe or a spoon. The calibrated syringe is designed to deliver the daily maintenance dose (0.1 mg/kg or 0.05 mg/lb). You cannot use the calibrated syringe for dogs under 2.3 kg (5lbs), instead apply as drops from the bottle into your dog’s food, using the dropper bottle: one drop for each pound of body weight or two drops for each kilogram of body weight. 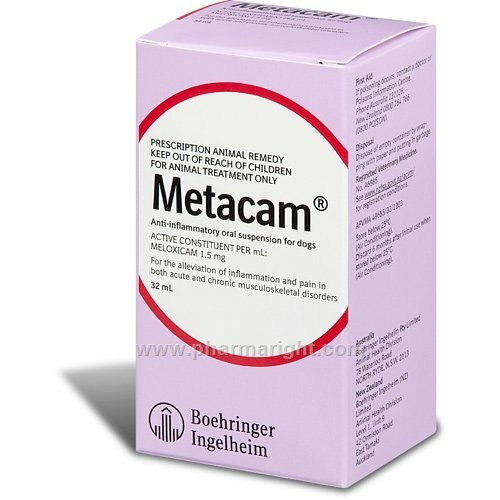 Metacam oral suspension is for use only for dogs. Ensure that you wash your hands after administering a dose to your dog, to prevent ingesting any Metacam oral suspension. How long should you give Metacam to your dog? Metacam oral suspension has an unlimited duration of use and can be given to your dog long-term for as long as there are symptoms of osteoarthritis, to keep your dog pain-free and mobile. If you forget to give a dose of Metacam oral suspension to your dog, admisister it as soon as you remember, unless it is time for the next dose, then skip the missed dose. Do not give your dog a double dose. How should Metacam be stored? You should store your Metacam oral suspension in a cool dry place below 30°C.